The Huggies Catalina offer is BACK! Earn a $5 Catalina Coupon to Use on Your Next Purchase, when you spend $25 on participating Huggies products listed below. 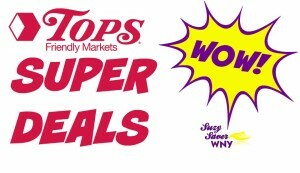 This offer is valid through 4/13/19 at Tops Friendly Markets, Shop & Shop, Giant/Martins and possibly other stores as well. Thanks to Christina M. for sharing! You can Mix & Match any $25 in participating Huggies products for these deals. You will only earn one $5 Catalina per transaction. If you are doing more than one of these deals, be sure to split your orders into separate transactions. You can use the $5 Catalina from the first transaction to help pay for the second transaction and just keep rolling them. PLUS, Tops Markets Shoppers will also EARN 1 Diaper Club Point for every dollar spent on diapers and training pants. Once you have accumulated 100 Diaper Club Points, you can redeem them for a $20 coupon to be used on your next Diaper Purchase at Tops Markets! The more coupons that you have, the more transactions that you can do. Keep rolling this deal until you earn your $20 Diaper Club BONUS! Leave a comment below if you know of any other stores that are running this Huggies Catalina Offer.